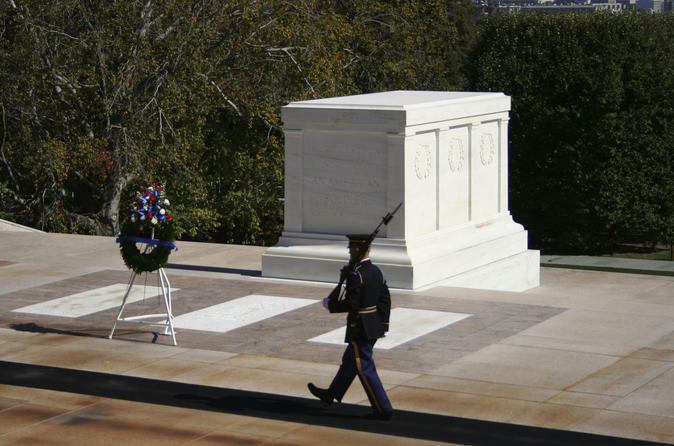 Experience Washington DC and the Arlington National Cemetery on this half-day tour. You will officially meet your USA Guided Tours tour guide as you hop aboard our comfortable, climate-controlled luxury tour bus for a memorable journey through the National Mall. On your journey through the nation's capital, we'll take you to the White House (exterior), Lincoln Memorial, World War II Memorial, and other iconic monuments. You will Spend 10 to 15 minutes at each stop with your guide as you learn the history behind each landmark/monument. The tour concludes with a narrated trolley tour of the Arlington National Cemetery (self-guided tour with tickets for narrated trolley tour). Take the tour of the Arlington National Cemetery and see the U.S. Marine Corps War Memorial, President John F. Kennedy grave site, U.S. Coast Guard Memorial, U.S. Army Gen. John J. Pershing's grave site, the Tomb of the Unknown Soldier, and the Arlington House (The Robert E. Lee Memorial). Tour ends at The Arlington Cemetery. You will also have great opportunities to take photos of your memorable experience.